Aug 10, 2015 - comparison, again both with and without the centroid. ... Materials. Stimuli were displayed as 1600 Ã 800 pixel images on a 120hz Samsung SyncMaster 2233 ...... Accuracy of iPhone locations: A comparison of assisted GPS,. equilibrium constraint is formulated by applying the duality ... Dual variables for equality constraints ... interactions among energy carriers and decision-making. aimed to determine the effect of interpersonal communication skills training on job satisfaction among the nurses working in Al-Zahra ... Access this article online. Quick Response .... nurses (technician, BS and MSc) and healthcare workers. Australian Planner. 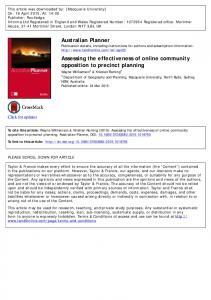 Publication details ... Keywords: community engagement and participation; social media; Sydney. Introduction ... using social media and smartphone applications can .... The DPI post-exhibition response dealt with traf-. CLT0010.1177/0265659015574918Child Language Teaching and TherapyFalkus et al. design. Children were assessed over a baseline period prior to receiving therapy and again after completing the therapy. Outcome measures in the study were a parent rating scale (see Appendix 1) used to measure the parents’ interaction skills, a measure of the child’s mean length of utterance (MLU) and the ratio of time that the child spoke to the time the parent spoke. Each measure was expected to remain stable during the baseline and improve after therapy. 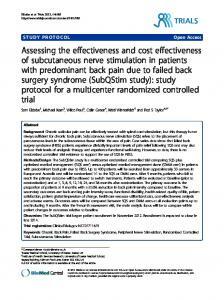 II Method The research took place within a Community Healthcare NHS Trust. Clinics within the Trust were asked to participate and to identify possible participants. A working party of senior therapists experienced in PCIT was set up to monitor the research. 1 Participants Eighteen parent/child dyads were entered in the study. Entry criteria were that children were between 1:09 and 3:06 years at the time of their first clinic appointment and had not previously received therapy. In this initial study children with English as an additional language (EAL) were treated but excluded from the research due to the difficulties that might arise when scoring use of their first language in the videos. The children were consecutive referrals. Fifteen were male and three were female. Their mean age was 29.6 months (standard deviation 4.5). PCIT is offered as the default first therapy for children with language delay. In clinical work an initial video is used to verify the need to improve interactions between children and parents. Children were excluded if they had language difficulties secondary to other disabilities or were on the autistic spectrum or whose parents did not consent to the therapy. Children were assessed on the Pre School Language Scale (PLS4; Zimmerman et al., 2009). All the children were below the mean for their age. Five were less than one standard deviation below the mean, seven were more than one and six more than two standard deviations below the mean. The mean standard score was 77.6 (standard deviation 14.6). 2 Therapy The NHS Trust in which the research took place has developed a standard procedure for conducting PCIT. Clinicians see referred children with a parent or carer and decide whether PCIT is appropriate. An appointment is then made to begin the therapy, which lasts for 10 weeks. This involves an initial four weeks of clinic based therapy followed by five weeks of consolidation during which parents practise strategies at home without the therapist. The parent and child attend an assessment appointment in week 10 where the child’s language and communication skills are discussed and compared with those at their initial assessment. Clinic sessions last approximately one hour and aim to give parents strategies to support interactions. In the first session a video is made of the parent playing with their child. Parent and therapist watch and discuss the video together. The therapist highlights positive strategies used by the parent and introduces the parent rating scale (see Appendix 1). This scale is used by parents to rate themselves and, in the present investigation, as an outcome measure to assess their progress. It lists interaction strategies and parents are asked to rate their performance in the video. A discussion of the objectives of the therapy and their intended effects on the child can then take place. The table in Appendix 2 lists strategies and the rationale for them and is used by therapists in giving advice to parents. Its use helps to ensure a consistent approach in the advice given by different therapists. The parent chooses a strategy they rated as using ‘never’ or ‘sometimes’ on the parent rating scale and works on this at home during the week. Parental selection of strategy at this stage is used to encourage involvement and ownership of the therapy. The therapist explains the chosen strategy, discusses it with the parent and the impact it can have on their child’s communication. Parents are asked to practise their chosen strategy by playing at home with their child during 3 to 5 ‘special times’ per week. An information leaflet to support parents in using their strategy at home is given. In subsequent sessions, the therapist discusses the parents’ use of ‘special time’ and whether they have seen changes in their child’s communication skills. A further video of the parent and child playing together is made. Parent and therapist watch this together and discuss the parent’s use of the target and other strategies and their impact on the child. The video is paused and replayed where appropriate to highlight specific positive strategies. If the target strategy is being used confidently, a further target strategy is suggested by the therapist, agreed with the parent and discussed. As in session 1 another video is made to practise and observe the new strategy. In this way the parent will practise the use of 3 or 4 strategies during their sessions at the clinic. In session 4 the therapist will seek to consolidate the strategies that have been practised. They will ensure that parents feel confident about the strategies they will practise during the consolidation period. During the consolidation period parents practise the strategies and try to generalize their use to everyday routines and activities. At the final review appointment parents are invited to comment on their use of the interaction strategies and the impact on their child’s communication. A final video is made of the parent and child playing and is viewed and discussed with the parent who also rates their performance on the parent rating scale. The child’s communication skills are reassessed and future management is planned. Table 1. Mean scores at each time point for parent ratings and child’s mean length of utterance (MLU) (s.d. given in parentheses). number of behaviours that occur in parent–child interactions and is widely used clinically. Then they identified and transcribed the children’s vocalizations in order to calculate the MLU. Following the procedure used by Baxendale and Hesketh (2003), utterances that were imitations of the parent or that reflected rote learning (e.g. nursery rhymes) or were repetitions of a word or phrase within the same utterance were discounted in this calculation. However, utterances that were judged to be initiations or responses to the parent but were not meaningful (common for some participants) were included but received a MLU of 0. These utterances were then used to calculate the child’s MLU. Scorers then replayed the videos and timed (with stop watches) the utterances of children and parents during the interaction so that the ratio of child to parent speech could be calculated. Although this measure does not assess the quality of the speech used, it does reflect the extent to which the parent is able to encourage participation by the child. III Results Each of the outcome measures – parent rating score, child’s mean length of utterance and the ratio of child to parental speech – were analysed using one factor within-participant analyses of variance followed by planned comparisons of the individual means. In the case of the parent rating scale the advice of Clark-Carter (1997) that ordinal scales of measurement with more than 20 values may be analysed using parametric tests was taken. Table 1 gives the means and standard deviations of each outcome measure at the three assessment points. A significant difference was found between the assessments of the parent performance (F(1.33, 22.56) = 26.66, p < .001, η2 = 0.61, Greenhouse–Geisser correction applied due to lack of sphericity). Planned comparisons showed that no difference existed between the pre therapy measures but that the difference between the second pre therapy and the post therapy assessments were significant (p < .01, η2 = 0.55). MLU data from one video was not reported by the scorer. The table reports the data for the remaining 17 participants. Again the differences between the three assessments were found to be significant (F(2, 32) = 5.96, p < 0.01, η2 = 0.27), and planned comparisons found no difference between the two pre therapy assessments and a significant difference (p < .05, η2 = 0.22) between the second pre therapy and the post therapy assessments. Table 2 reports the data on the times of child and parent speech. As it shows parents reduced and children increased the time they spoke. The analysis of variance carried out on the ratio of child to adult speech showed a significant difference between the assessments (F(2, 34) = 9.77, p < .001, η2 = 0.36). Planned comparisons again found no difference between the pre therapy assessments and a significant difference (p < .01, η2 = 0.37) between the second pre therapy and the post therapy assessments. In summary, consistent results were found for each of the outcome measures. Each improved slightly but not significantly during the baseline period. The changes over the treatment period were significant for each measure and the effect sizes were large in each case (Cohen, 1988). Falkus et al. Table 2. Mean number of seconds for which children and parents spoke and the ratio of child/parent speech (s.d. given in parentheses). disorders (Allen and Marshall, 2011) have been published. It is commonly used with young children with delayed language but evidence for its effectiveness is lacking. The present article is a first step towards acquiring this evidence. Declaration of Conflicting Interests The author(s) declared no potential conflicts of interest with respect to the research, authorship, and/or publication of this article. Funding The author(s) received no financial support for the research, authorship, and/or publication of this article. References Allen J and Marshall CR (2011) Parent–child interaction therapy (PCIT) in school aged children with specific language impairment. International Journal of Language and Communication Disorders 46: 397–410. Awcock C and Habgood N (1998) Early intervention project: Evaluation of Wilstar, Hanen and specialist playgroup. International Journal of Language and Communication Disorders Supplement 33: 500–05. Awde N (2009) The influence of cultural values on the parent–child interaction patterns of families from an Asian background. ARECLS 6: 1–17. Baxendale J and Hesketh A (2003) Comparison of the effectiveness of the Hanen programme and traditional clinic therapy. International Journal of Language and Communication Disorders 38: 397–415. Bernstein-Ratner N (2006) Evidence based practice: An examination of its ramifications for the practice of speech-language pathology. Language, Speech and Hearing Services in Schools 37: 257–67. Buschmann A, Jooss B, Rupp A, Feldhusen F, Pietz J, and Philippi H (2009) Parent based language intervention for 2 year old children with specific expressive language delay: A randomised controlled trial. Archives of Diseases in Childhood 94: 110–16. Clark-Carter D (1997) Doing quantitative psychological research: From design to report. Hove: Psychology Press. Cohen J (1988) Statistical power analysis for the behavioural sciences. 2nd edition. Hillsdale, NJ: Erlbaum. Conti-Ramsden G and Freil-Patti S (1986) Mother and child dialogues: Considerations of cognitive complexity for young language learning children. British Journal of Disorders of Communication 21: 245–55. Coulter L and Gallagher C (1998) Evaluation of the Hanen early childhood educators programme. International Journal of Language and Communication Disorders Supplement 33: 264–69. Cummings K and Hulme S (1997) Video: A reflective tool. Speech and Language Therapy in Practice Autumn: 4–7. Ellis Weismer S and Robertson S (2006) Focused stimulation approach to language intervention. In: McCauley RJ and Fey ME (eds) Treatment of language disorders in children. Baltimore, MD: Paul H Brookes, 175–202. Gibbard D, Coglan L, and MacDonald J (2004) Cost effectiveness analysis of current practice and parent intervention for children under 3 years presenting with expressive language delay. International Journal of Language and Communication Disorders 39: 229–44. Girolametto L (1988) Improving the social conversational skills of developmentally delayed children: An intervention study. Journal of Speech and Hearing Disorders 53: 156–67. Girolametto L, Pearce P, and Weitzman E (1996) Interactive focussed stimulation for toddlers with expressive vocabulary delays. Journal of Speech and Hearing Research 39: 1274–83. Girolametto L, Weitzman E, and Clements-Baartman J (1998) Vocabulary intervention for children with Down syndrome: Parent training using focussed stimulation. 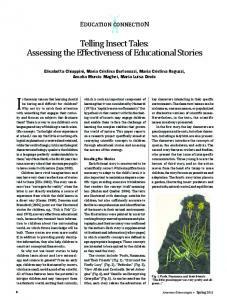 Infant-Toddler Intervention: A Transdisciplinary Journal 8: 109–26. Joffe V, Flood E, Dodd B, and Pring T (in preparation) Assessment and intervention choices of paediatric speech and language therapists: A national UK survey. Sitting where your child can easily see you Waiting for your child to start the talking with words/sounds/gestures, etc. Report "Assessing the effectiveness of parentâchild ..."